The retractable undercarriage legs terminated in inflatable rubber cushions. 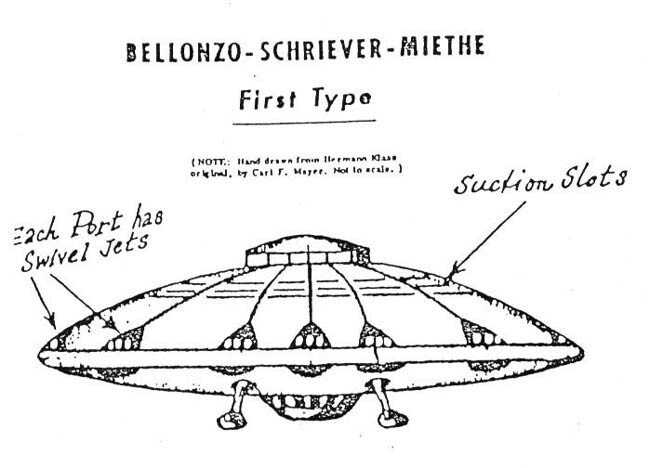 The craft was designed to carry a crew of three The "Schriever-Habermohl" flying disc developed between 1943 and 1945 consisted of a stable dome-shaped cabin surrounded by a flat, rotating rim. Toward the end of the war, all the models and prototypes were reported destroyed before they could be found by the Soviets. According to postwar U.S. intelligence reports, however, the Russian army succeeded in capturing one prototype. After the war, both Schriever and Miethe, another German scientist involved in the design of flying disks, came to work for the US under ‘Operation Paperclip’. Habermohl was reported, by U.S. Army Military Intelligence, as having been taken to the Soviet Union. The first non-official report on the development of this craft is to be found in Die Deutschen Waffen und Geheimwaffen des 2 Weltkriegs und ihre Weiterentwicklung (Germany's Weapons and Secret Weapons of the Second World War and their Later Development)., J.F. Lehmanns Verlag, Munich, 1956. The author of this detailed and technical work on German wartime weaponry was Major d.R. Rudolf Lusar, an engineer who worked in the German Reichs-Patent Office and had access to many original plans and documents. 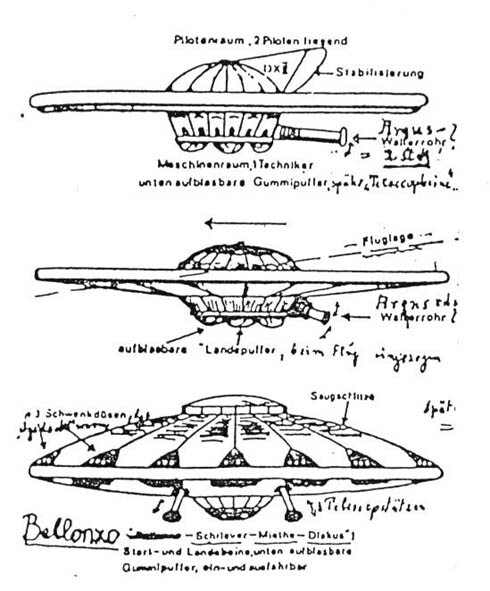 Lusar devoted a section of the chapter entitled "Special Devices," to Third Reich saucer designs. "German scientists and researchers took the first steps toward such flying saucers during the last war, and even built and tested such flying devices, which border on the fantastic. According to information confirmed by experts and collaborators, the first projects involving "flying discs" began in 1941. The blueprints for these projects were furnished by German experts Schriever, Habermohl, Miethe, and the Italian expert Bellonzo." Habermohl and Schriever chose a flat hoop which spun around a fixed pilot's cabin in the shape of a dome. It consisted of steerable disc wings which enabled, according to the direction of their placement, in horizontal takeoff or flight. Miethe developed a kind of disk 42 meters in diameter, to which steerable nozzles had been attached. Schriever and Habermohl, who had worked together in Prague, took off on 14 February 1945 in the first "flying disc". They attained a height of 12,400 meters in three minutes and a horizontal flight speed of 2000 KMH. It had been expected to reach speeds of up to 4000 KMH. Massive initial tests and research work were involved prior to undertaking the manufacture of the project. Due to the high rate of speed and the extraordinary heat demands, it was necessary to find particular materials in order to resist the effects of the high temperatures. Project development, which had run into the millions, was practically concluded by the final days of the war. All existing models were destroyed at the end of the conflict, but the factory at Breslau in which Miethe had worked fell into the hands of the Soviets, who seized all the material and technical personnel and shipped them to Siberia, where successful work on "flying saucers" was conducted. Schriever was able to leave Prague on time, but Habermohl must be in the Soviet Union, since nothing more is known concerning his whereabouts. The aged German builder, Miethe, is in the United States developing, it is said, "flying saucers" for the A.V. Roe Company in the U.S.A. and in Canada..
Georg Klein ran the Schriever, Habermohl and Miethe project for the Luftwaffe. When Kammler took over the program and it became an SS program, Klein was retained by Kammler. Klaus-Peter Rothkugel recounts a discussion between Klein and Kammler in which Kammler finally decides upon the Habermohl model for production purposes and tells Klein why. Klein did many newspaper articles, not tabloid articles, in the German press in the 1950's. Klein was a public figure then. In one article, Klein describes seeing a German saucer test flown at Prague airport. Josef Epp worked as a consultant on all three of these programs and took pictures of a test flight in 1944 which were published in his book. In a 2005 book, the late Heiner Gehring and Karl-Heinz Zunneck discuss the private memoirs of SS man Wilhelm Landig who, among other things, was responsible for SS security at the Prague airport. Landig says that the larger Haunebu-sized craft were real and flew at some point but that the propulsion system was nothing like described by many German writers and as in those alleged blueprints. Landig claims that the last three of these craft are stored, currently, in tunnels in the Andes. He says they no longer fly because of age and lack of spare parts. For years, he claims, a shadow group of technicians exchanged parts and knowlege world-wide to keep these things airborne. Landig calls them Rüstungesoteriker (arms esoterics).